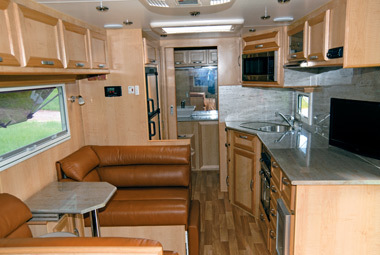 WHEN A COMPANY is called 5 Star Caravans, there is an inherent expectation that the vans it creates will sit at the top of the tree in terms of build, design and performance. To test this hypothesis, we hitched a 5 Star Caravan Premier MkII to a Toyota LandCruiser and headed north of Brisbane to see if it was everything its name promised. There is one important caveat: 5 Star Caravans is unlike most other brands in that it does not have a single manufacturer pedigree. Rather, 5 Star boss Robert Schulz orders caravans according to his specifications and clients' needs from a variety of 'ghost' manufacturers. This company model has some inherent problems, not the least being that it makes it difficult for 5 Star Caravans to provide vans built to a consistent standard. This problem has been a long-running bugbear for Schulz, but one he insists he is remedying by ensuring his suppliers meet a set of 5 Star build specifications. According to Schulz, this philosophy means "unmatched quality of construction inside and out". With that thinking firmly in mind, we took a look at the Premier MkII to see if the 5 Star seal of approval really did produce a high quality product. At first glance the Premier is an attractive rig. That said, the initial impression does not exactly bowl you over. To some extent, the van casts a similar silhouette to Windsor's Genesis, Sunland's Patriot or perhaps something from the Supreme range. Just the same, there are many points of difference. 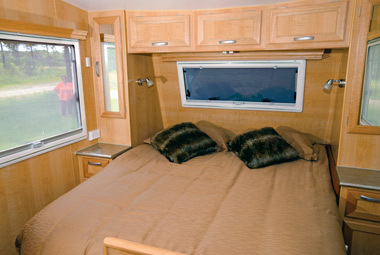 For starters, while the outside boasts Euro windows, others like the Windsor and Sunland arguably have more window space then the Premier MkII. Perhaps not as easily noticed, its 150mm galvanised chassis with rear bumper suggests a particularly solid build. As I hitched the van to our LandCruiser via the standard 50mm ball coupling, I noticed one downside (for me) to the drawbar: the absence of a stoneguard protecting the gas cylinders. True, there are plenty of vans getting about with almost identical setups, but I believe anything that could be in the path of a flying stone or other piece of road debris should be protected. From the outside, there is definitely an old school feel about this van, and that traditional look is not a bad thing. However, the van is not so traditional that it relies on simple leaf spring suspension. On the contrary, the Premier MkII rolls along on very contemporary Roller Rocker suspension. This setup is a fine choice, considering stepping up to, say, airbag suspension would be overkill for a van destined to spend its life travelling the highways. 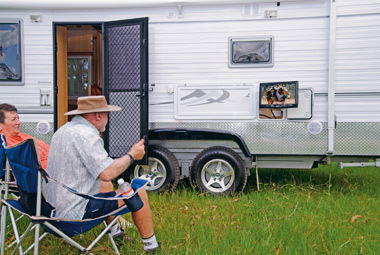 Roller Rocker suspension usually means a smooth weight transfer from the front to rear axle, reducing vibration and shock to the caravan. In keeping with its traditional build, the Premier has a conventional timber frame, which some might argue is hardly a state-of-the-art choice. After all, timber is susceptible to rot, right? Robert Schulz insists the potential for water ingress is reduced by tapering the top rails of the walls so that the framework follows the proper contours of the roofline. This should mean less water pooling on the roof, reducing the opportunity for moisture to seep into the framework. 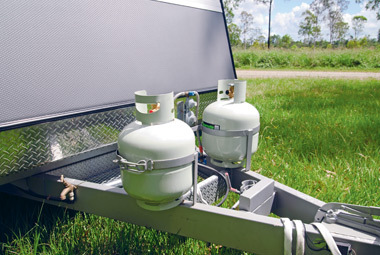 Our Premier MkII review van includes two 120W solar panels, three (protected) 80L water tanks and a pair of 9kg gas cylinders. That's a combo with which any long-term tourer would be happy. Storage-wise, the van's exterior capacity, including a front tunnel boot, is more suited to a van designed to spend its days inhabiting caravan parks rather than the back of beyond. 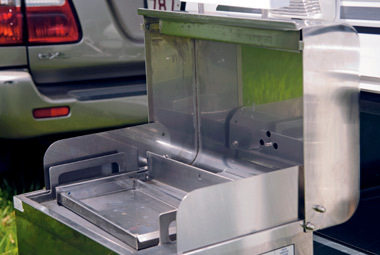 While the van's slide-out barbecue hints at good times to be had outside, it's reassuring when the interior provides the right degree of comfort. 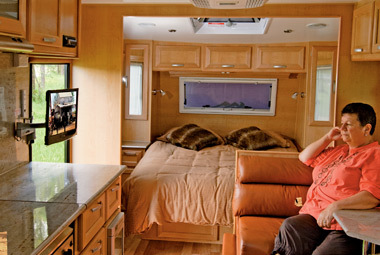 The Premier MkII's interior layout is cosy, but the bulkhead separating the bedroom from the kitchen/dining area reduces access around the queen-size bed. But the presence of a bulkhead itself is a positive structural feature, improving as they do a van's rigidity. Because our review van has fewer windows than some similar sized units, there is a potential for stuffiness on those sizzling summer days. Ready to provide some relief, a six-bottle wine fridge keeps the chardonay chilled, while reverse-cycle air-conditioning keeps you as cool or warm as you'd like. The use of timber veneer on well-presented cupboards and drawers, as well as leather upholstery, gives a naturally clean look and feel. 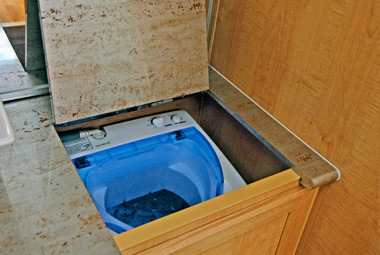 The ensuite's ceramic toilet bowl is a welcome and classy feature. 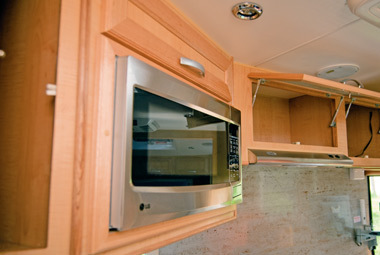 There was also a good supply of internal storage, throughout, including a full-height slide-out pantry. The name 5 Star conjures images of fine quality caravans, and there are certainly many elements of the Premier MkII that fit that idea. However, while this van is built well with plenty of features, maintaining that level of excellence while using multiple builders, both local and interstate, is 5 Star's greatest challenge. 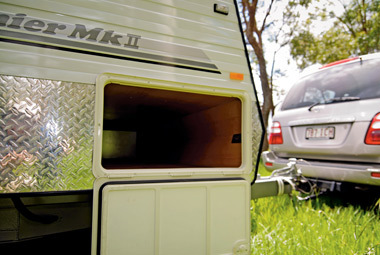 Source: Caravan World Jul 2011.